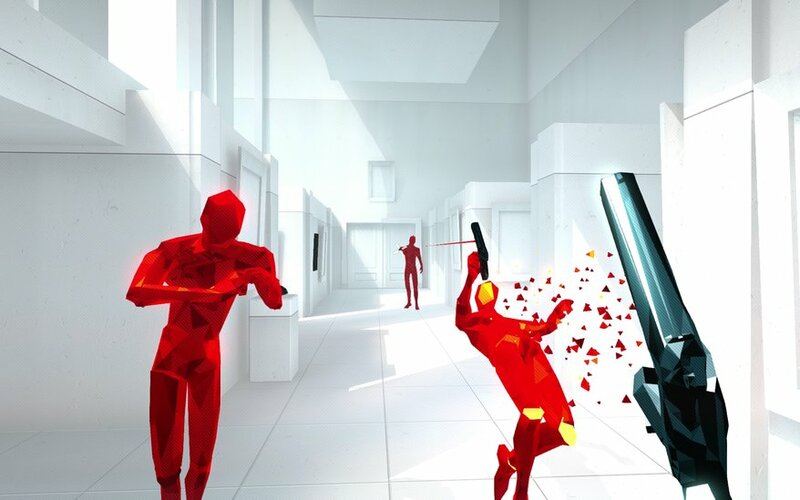 SUPERHOT is the most innovative shooters I’ve played in years. It relies on a couple of key gimmicks that bolster its success and fun factor, the most obvious being that time slows to a near-standstill each time that you, the player character, stop moving. Enemies freeze mid-jog, thrown objects hang in midair, and bullets push forward at a snail’s pace as you observe your surroundings and prepare your next move. You can attack foes with your fists, throw objects to disarm them and steal their katanas, pistols, shotguns, and rifles, and even make use of a new ability introduced late in the game to really mix up the formula in interesting and creative ways. The story mode is not particularly long – it will last most players around two hours. There is a narrative thread woven in that, while not too greatly in-depth, reaches a satisfying conclusion within that limited time frame, and does very well to match SUPERHOT’s aesthetic nods to works like The Matrix, Killer7, and a dozen other action films/games. The white backdrops of office cubicles, a narrow alley, bar, mansion staircase, and parking garage all require different approaches, and forcing players to plan out their plans of attack as well as adjust on the fly is refreshing in an era when most shooters would opt for the simple ‘run-and-gun’ formula. That isn’t to say that SUPERHOT is devoid of any flaws – there are a couple of stages where enemies are so tightly packed that the slightest movement of your character can cause you to end up in their line of fire, resulting in a retry of that stage. And the aforementioned gameplay mechanic that is introduced late in the experience (the nature of which I will not spoil, given how much it turns familiar strategies on their heads), does not see as widespread of use as it probably deserves. Still, predicting enemy movements is fun, gauging the distance between yourself and a red polygonal foe intuitive, and for a first outing, SUPERHOT is fun, responsive, and visually engaging game with its minimalist digital style. For anyone turned off at the notion of a two hour story mode, fret not – there is plenty more to be explored in SUPERHOT’s additional game modes. Endless mode sends waves of increasingly well-armed foes your way, and asks you to take down as many of them as possible before they overwhelm you. There are variants of this mode that act as a time attack, or simply ask you to execute twenty kills in a row. Challenge mode, meanwhile, requires you to revisit the stages of the story with a specific weapon, like a katana, in hand, and asks that you kill all the foes with only that type of weapon.